Below are the top 6 saving secrets I've found which can help you put your savings and investment plan on track to deliver what you hope for. Right up front, I want to say that I haven't always been great with money. In my early 20s I was reckless with my cash and got several $10,000s of into debt. Because of the pain of that experience, I vowed never to let myself be short of cash again. And since then, without wanting to sound immodest, I've become a committed and successful saver and "budgeter". I'm going to show you the system of saving I've used for the last 12 years which has enabled me to pay off my debts, meet all my bills on time and build up an investment fund more than 4 times the gross salary I started those 12 years on. In other words it's worked! It's something I'm going to show my children as soon as they're old enough to understand and that I've taught my 17-18 year old students (my day job is as a school teacher). I'm going to show you the actual schedule of my monthly incomings and outgoings - I'm way past self-consciousness here - this stuff is way too important. Never consider your income "gross", always "net"
Whatever you earn, it's so easy to think of your gross salary as your income. If you earn $60,000 a year, you get $5,000 a month, right? Of course we all know that we have to pay taxes, but quite often they come as a shock, because we've psychologically geared ourselves up to "earn $60,000" and we spend accordingly. ... minus your fixed monthly costs. That's right. You might take home $3,500 after tax each month, but after rent / mortgage, car costs, insurance, child care costs, commuting costs and so on, you really only have the freedom to spend a small fraction of your take home pay. This is probably the most unspoken of the saving secrets, but it's the truth! Below is my monthly income and outgoing sheet. As you can see, I deduct all my fixed monthly outgoings - mortgage, commuting costs, money for investment and so on from my net income. I also have a dedicated savings pot for things which I will want to buy in the future like holidays, a new car, work clothes and other periodic expenses. My spreadsheet has a column for monthly bills and annual costs. I make a point of never paying for things like car insurance on a monthly rather than annually as this option almost always costs more (this is another of the smaller saving secrets). All those annual costs on the spreadsheet are divided by 12 to give a monthly amount and everything is taken off my net monthly income, which leaves me with what I can spend how I wish. As you can imagine that final figure is WAY less than what I started with (£270 out of £3200), but what do I really have left to spend it on? Two holidays a year, a fairly new car every 5 or 6 years bought outright, a slush fund for things that might go wrong with my home, my golf, skiing and everyday expenses are all covered. I keep a sheet for each quarter of the year and deduct what I spend on larger purchases from £810, because that way if I want something that costs a somewhere around £1,000, I can see that if I'm a little frugal this quarter, I'll be able to get it when the next quarter comes around. Plus, because I've been careful like this for 12 years and because I've always estimated conservatively (see savings secret #4) I've built up a few hundred pounds buffer in my primary account to keep me from going overdrawn if I splurge a little. ... and I pretty much always feel good about my financial position. Having had bad experiences in the past I realise that my willpower alone isn't strong enough to pay my bills on time and ensure that I'll set aside all the money I need for future expenses. The pull of extra purchases and seductive offers simply proved too strong for me in the past and very often I ended up overspending and then not having the required amount left to meet a large - but predictable - bill such as car insurance. 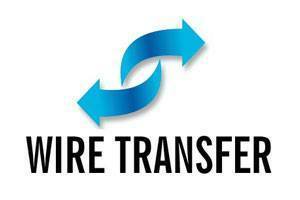 All fixed outgoings / saving pots & investments are transferred into separate accounts BY AUTOMATIC TRANSFER. I'm left with what I can spend during the month. Transferring cash from my checking account into other accounts or savings pots is one of the key saving secrets and this mechanism means I haven't missed a single payment for any bill or failed to have enough saved up when an annual bill comes through. It also means I have deposited a significant amount into my dividend investment fund every single month. I used to have all my cash coming into and leaving one single account each month. Large expenses and small went out and my bank statement was a complete mess. I couldn't really tell whether I had enough in my account to go out for a drink with friends after work. Many a time, a bill would come in and I simply didn't have the cash to pay it and that led me into debt. Now I have a bunch of accounts which work as "savings pots", each named for its purpose - my bank allows you to have as many as you need - and when an annual bill falls due, the money is there to cover it. You won't believe the difference it makes to KNOW that you can't be short when a bill comes in. That's why, if you don't have automatic transfers from your primary current account into separate accounts or savings accounts (many banks offer this facility), then I urge you to do so straight away! Yes, it takes some effort and may take a couple of phone calls or a visit to your bank to get this set up, but it really isn't much compared with the feeling of security you have when you've got plenty of money saved up to cover all your expenses and will not go (further) into debt. Let's say you're not quite sure what your car insurance, gas and car maintenance costs will be next year (nobody can really know these). When drawing up your budget for the next year, I recommend you estimate that these costs extremely conservatively... and then add 5% for good measure and set up your automatic transfer for that amount. All of the unpredictable amounts in my spending sheet above have about 5% extra built in. You might think this is going over the top and that it'll lead to you having no spending money left to enjoy, but trust me, it won't. Here's perhaps the best of the saving secrets I have discovered: Just because you've moved money out of your main account into your "Car running costs" pot, doesn't mean you're going to spend more on gas... I'm going to drive as far in the year as I'm going to drive, and anything I save up beyond what I need, I spend or invest in one big chunk! At the end of the year, there'll probably be some money left over in your "car pot" and you get to spend this in one big splurge. Just this week, I realised I had over-saved to the tune of £625 (roughly $750) in one of my pots and boy, did I enjoyed myself! When else would I - a middle earner with two kids under 5 - be likely to have that much cash, just sitting there waiting to be spent, entirely guilt free? Before using these saving secrets, I know I never did - the money just dribbled out of my account and I had neither enough to comfortably pay for my car nor for the odd treat. 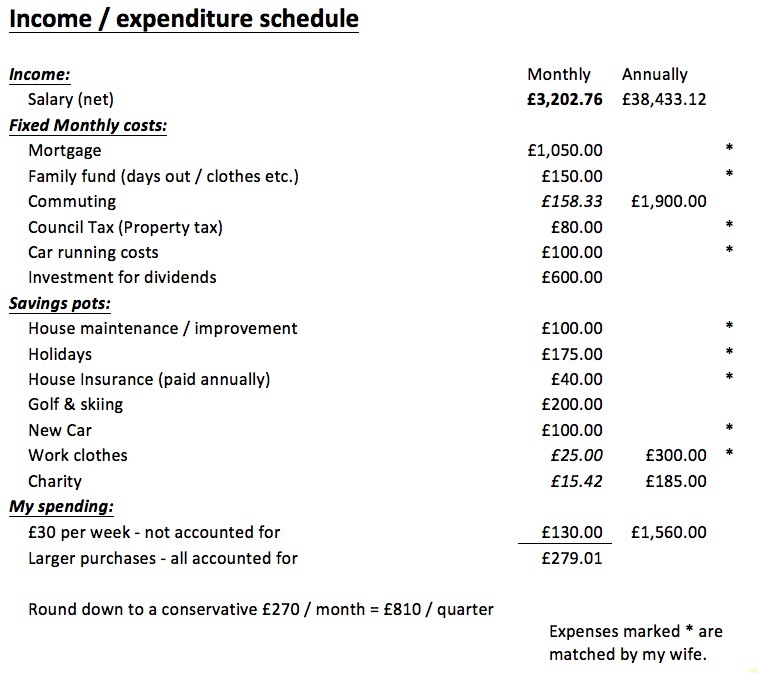 The penultimate line on my budget is called £30 per week - roughly $45. On the sheet it's calculated as a monthly amount (i.e. (£30 x 52 weeks)/12 months). This is cash I withdraw each week from the ATM and keep in my wallet for those everyday expenses - the coffee on the way to work, the beer with a friend, buying shampoo and deodorant, flowers for my wife - that sort of thing. I'm a creature of habit and visit the ATM every Thursday for this. 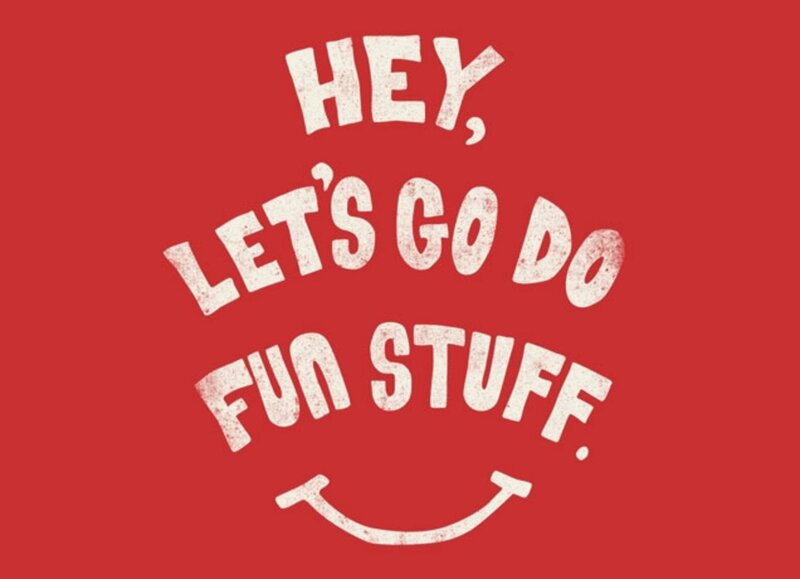 I tried Mondays, but often I'd spent it by the time the weekend came around, when I really wanted it! Thursdays just seem to work best. This is the only spending I don't write down. Now, $45 might not be enough for you. It wasn't for me pre-kids when I had a more sociable lifestyle, back then I had £100 per week on my budget for this "casual spending", but I still had it there. The reason? ... Everything I spend beyond £30 a week I religiously write down. Writing down your expenses is an age-old trick, just the same as your doctor getting you to write down everything you eat if you're trying to lose weight. Business guru Peter Drucker famously said: "What gets measured, gets managed" and in my experience that's exactly right. Writing down your spending - "measuring" it - will make you act more responsibly. So, on my budget, the amount I can spend on larger purchases is the amount at the bottom of the sheet after all the fixed costs and transfers to savings pots have been taken off. On this sheet it's the £270 at the bottom. With this amount, I buy clothes, meals out with the family, birthday presents and the like - things I'm likely to spend sums of say $50+ and EVERYTHING gets written down. I keep a list on my smartphone on a very simple excel sheet that gives me a running total, having added in the "larger purchases" amount every three months from the budget. I know that if I can keep the running total on this sheet at or above zero, then my children will have food on the table, my mortgage will be paid and there'll be enough to run the car, have a holiday, have fund and most importantly KEEP ME OUT OF DEBT. Every month I get my bank statement and credit card bill and make sure I haven't sneaked extra purchases through under the radar - I know I have to be honest and disciplined if I want life to work out! On my budget, you'll see that there's a line entitled "Golf & skiing". Besides my family, these are my two great passions. I have a savings pot set aside with cash for these. The "golf" side of it covers an annual membership subscription to a club and some new equipment every now and then and the "skiing" part gives me enough for a trip to the European Alps every year. It feels like these are my rewards for budgeting carefully throughout the year - and I thoroughly enjoy them without worrying about getting into debt. Budgeting can seem boring and I believe most people don't do it because they can't face the truth of how much (or little) of their monthly wage packet they actually have the freedom to spend. 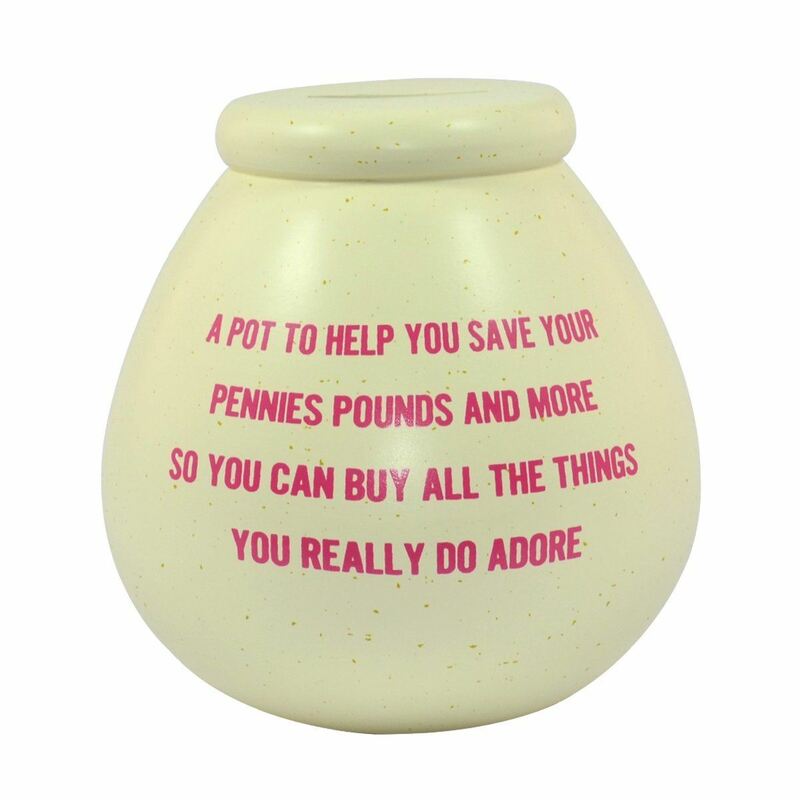 But budgeting and get your money sorted into pots are true saving secrets. Once you do it, you'll feel like a weight lifted from your shoulders. You know when to accept an invitation which will be costly and when not. When to splash out on a purchase and when to economize. These saving secrets are what have helped me to put aside money each and every month to invest in dividend earning stocks, and that's what the rest of www.RetireOnDividends.com is about. So let's go and invest to make some serious long term growth! These saving secrets give the close up detail of a budgeting system that works for me. If you found it helpful, take a look at our article on tips to help you save, which shows the bigger picture getting into a position to save in the first place.